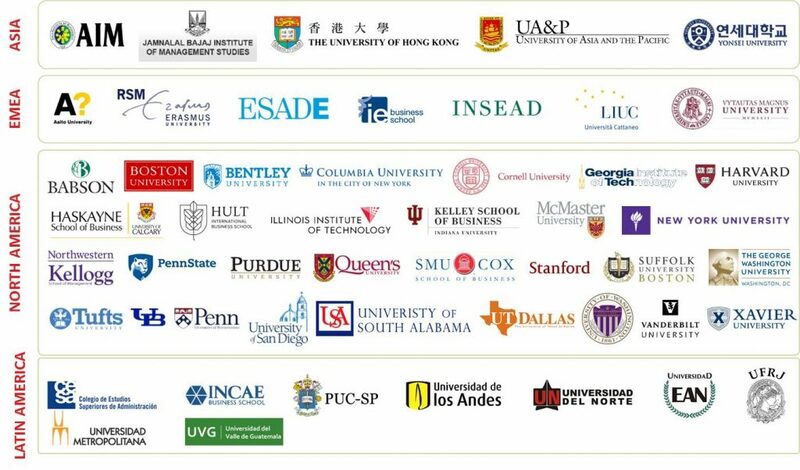 Many more schools, such as Harvard, Stanford, Chicago Booth, or Purdue in the United States and scores of other leading schools on 6 continents participate as a club activity or for independent study credit. The IXL Center originally worked with Hult International Business School to develop Action Projects as a capstone course that enable students to gain real innovation and management consulting experience. Designed, organized and managed by the IXL Center, Action Projects were offered at the Hult campuses in Boston, Dubai, London, New York, San Francisco, Sao Paulo and Shanghai. The Innovation Olympics are now organized as a quarterly global competition, conducted virtually, although some schools choose to have events on campus or to send teams to present directly to the corporate executives whose challenge they studied.